The crater in the foreground is one of the engine shafts, which has been backfilled after operations ceased. To the left are the remnants of the engine house, which had a gap Link on the side facing the shaft for the rope to pass through. The Nant Ddu passes through the gap between the engine house and the spoil tip at the back. The shaft Link , engine house Link and spoil tip Link all have individual entries in the Coflein database. Cyfartha mine is also known as Nantddu mine since most of its buildings are located in the valley of the Nant Ddu. Mine operations at Cyfartha lasted from 1842 to 1881. The ore was mined mostly for its lead and copper content. Cyfartha was an underground mine, with access to the levels through a number of shafts. Power was generated using two water wheels and a horse-powered whim. The water feeding the wheels came mainly from the Nant Ddu, supplemented by a long leat abstracting water from the Nant Goch about a kilometre to the north. Since the water wheels are located lower than the openings of the engine shafts, power was transmitted using a flatrod system, i.e. a series of linked iron rods moving backwards and forwards as the wheel turns (see Wikipedia article on Eylesbarrow mine in Devon Link for details of the mechanism). 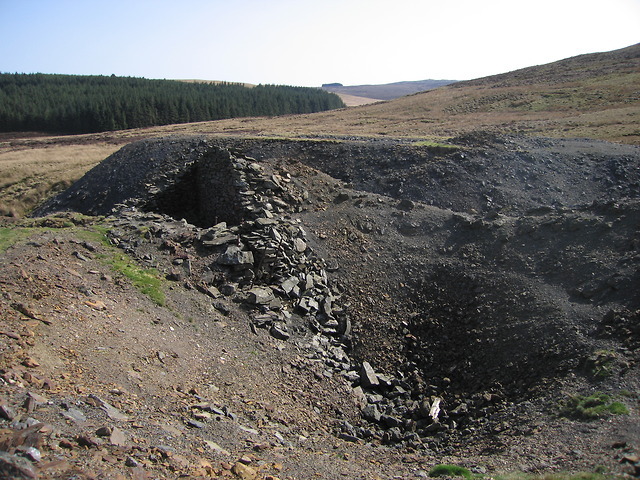 For a detailed description of the mine, see Clwyd-Powys Archaeological Trust Link . Cyfartha mine as whole is listed in the Coflein database Link . © Copyright Rudi Winter and licensed for reuse under this Creative Commons Licence. This page has been viewed about 83 times.